One of the things that has struck me on returning to The Lord of the Rings (and The Hobbit) is the ambivalent quality of forests in Tolkien’s fiction. I say “ambivalent” because, for an author who expresses a deep sense of antipathy to modernity and industrialism, and a corollary nostalgia for a premodern, agrarian England, his fiction is suspicious of forests. If on one hand the Shire is a utopian depiction of a pre-industrial society living in something resembling harmony with nature; and on the other Mordor is a nightmarish hellscape visited on the land by industry and technology; there is a third space in Tolkien’s fiction, not necessarily blighted by the evils of modernity, but also comparably dangerous. This is the “wild,” in which such havens as the Shire and Rivendell exist as an archipelago of safe spaces amidst huge stretches of untamed country. And forests in Tolkien comprise some of the most perilous parts of the wild. There are a number of ways in which the Old Forest, the first of the hobbits’ obstacles after leaving the Shire, is more menacing even than Mirkwood was in The Hobbit. To be certain, they get through it in just a day, the forest itself is not as dark and foreboding, and there’s a distinct lack of giant spiders. But where it was the inhabitants of Mirkwood that made it dangerous, the Old Forest is itself malevolent: the trees whisper to each other, the paths shift and change, the trees crowd in on the hobbits and lower over them, and of course Merry and Pippin find themselves trapped in the bole of the most malevolent of all the trees, Old Man Willow. In one sense, the adventures Frodo and company have in the early stages of Fellowship are very much of a piece with The Hobbit, and their travails in the Old Forest have little of the gravity and indeed terror of what is to come later in the novel. I will have more to say about this in a later post: but for now, it is worth noting that, for all the eeriness and foreboding on display in the Old Forest, it lacks the dread we experienced in Mirkwood, and however nasty Old Man Willow is, he is preferable to an encounter with the Black Riders—the avoidance of whom was the whole point for the circuitous route through the forest. And yes, it also doesn’t help things when the hobbits are rescued by a droll fellow in yellow boots with a fondness for nonsense rhymes. I am by no means the first reader to note that the adventure in the Old Forest, the appearance of the annoyingly flamboyant Tom Bombadil, and the subsequent blundering in the Barrow-Downs are far more of a piece with the tone and style of The Hobbit than with what The Lord of the Rings will become. I am also not the first reader to speculate that these episodes were written when Tolkien was still in The Hobbit’s head-space and his new story was still merely a sequel. Peter Jackson was not unwise when he elided them from the film: the novel can bear them, but having them in the movie would have made it (even more) dilatory. Tom’s words laid bare the hearts of trees and their thoughts, which were often dark and strange, and filled with a hatred of things that go free upon the earth, gnawing, biting, breaking, hacking, burning: destroyers and usurpers. It was not called the Old Forest without reason, for it was indeed ancient, a survivor of vast forgotten woods; and in it there lived yet, ageing no quicker than the hills, the fathers of the fathers of trees, remembering times when they were lords. Forests are crucial thematic spaces in Tolkien, always the sites of adventure or tribulation. And they are always perilous: even the haven of Lothlorien is spoken of darkly by the men of Gondor, as Boromir’s reluctance to pass through it attests. They are the true wilderness, but unlike the more amorphous designation “the wild,” forests possess power and dangerous sentience: the Old Forest, Mirkwood, Fangorn, Lorien. Of the races of Middle-Earth, only the Elves seem to have power over the woods, which is less perhaps power over them than a certain affinity—possibly the shared sympathy of the long-lived. As I mentioned, Tolkien’s ambivalence to forests might seem incongruous at first glance, considering his utopian depictions of the pastoral. It is however important not to mistake his sentimental, nostalgic figurations of the Shire with an unequivocal embrace of all nature. Tolkien is no enthusiastic naturalist—he’s certainly no tree-hugger. The Lord of the Rings does decry indiscriminate logging, but in Middle-Earth you take your life in your hands doing violence to forests (after all, you never know if the oak you’re attempting to fell is an Ent). In many ways, C.S. Lewis is far more unambiguously sentimental about nature in the Narnia chronicles—like Tolkien, he imbues his forests (and rivers and animals and, really, any avatar of nature) with sentience and spirit, but solely within the borders of Narnia; and no right-thinking human need fear nature, as all falls under Aslan’s benevolent rule. Tolkien, by contrast, is rather more clear-eyed about the dangers of the untamed wild. The Shire is a deeply nostalgic and romantic recreation of pre-industrial England—but unlike most of the rest of Middle-Earth, it is post-medieval in character and nature. The Shire is a haven largely because nature there has been tamed into well-tilled fields, small forests that have been domesticated into pleasant locations for hikes, and criss-crossed with that crucial hallmark of civilization: roads. It is, perhaps, not a coincidence that the unsung hero of The Lord of the Rings is Samwise Gamgee: Sam after all is a gardener, tasked with tilling and pruning and taming nature; and at the end of The Lord of the Rings it is he (with help from Galadriel’s gift) who heals the Shire from Saruman’s industrial depredations. 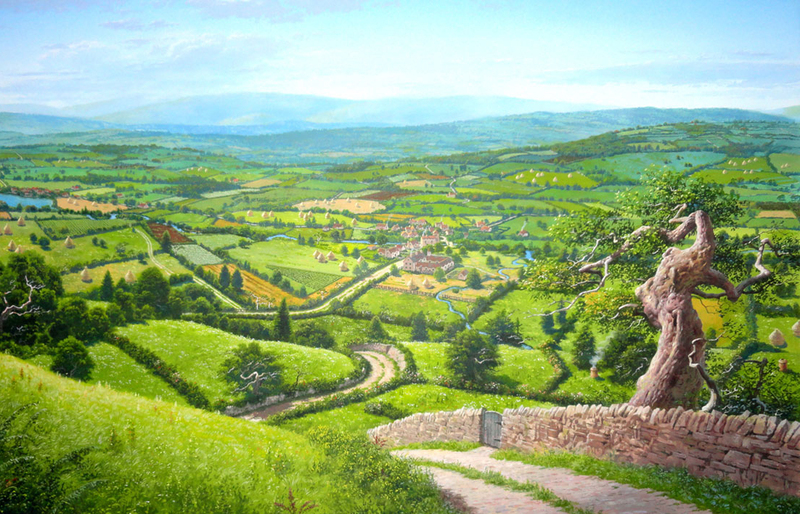 Ted Nasmith’s artistic rendering of Hobbiton. Fantasy is—pretty much by definition—a mishmash of geographies, histories, and mythologies: and if the Shire is Tolkien’s affectionate homage to his own rural upbringing, the Old Forest is our first substantive glance into Norse mythology, in whose imagination dark and dangerous forests loomed large. The trope of the “enchanted forest” is eminently familiar in folk- and fairy-tales, as well as in medieval romances: it is almost always a space of testing and tribulation, in which the already tenuous laws of reality are jettisoned even further. The term in Germanic mythology is myrkviðr (myrkvithr), which translates as “black forest” or “dark wood” or … Mirkwood. (myrk=murky, dark, viðr=wood, forest). Which in the very thought renews the fear. (Inferno, I:1-6). Of course, the danger of forests in this respect was (is) the fear of being lost. The forest is where one might be led astray and abducted by the faerie, and where one might expect to encounter magical beasts. It is a common enough motif and metaphor that it seems like a given that Hogwarts would have one: I always feel J.K. Rowling uses the enchanted forest (“Forbidden Forest” in the Harry Potter books) in a pro forma sort of way—as if a school of magic that is also a castle wouldn’t quite be complete without a mysterious forest off-limits to students (but where they venture anyway). 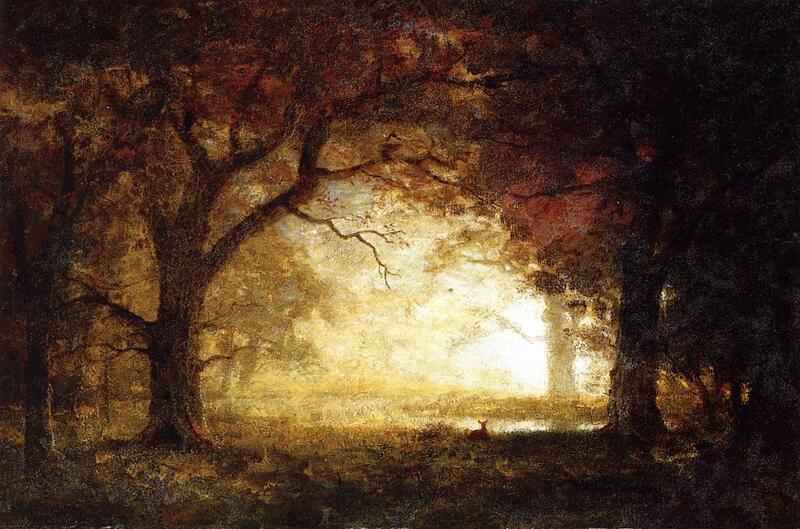 “Forest Sunrise” by Albert Bierstadt. In The Hobbit, Mirkwood is deliberately evocative of the German Schwarzwald, the Black Forest, the setting of numerous German folk-tales and legends; in the Norse tradition “crossing the Black Forest” was a trope representing the trespass from one world to another. To reiterate an earlier point, the Old Forest is not nearly as dark and claustrophobic as Mirkwood, but it is oddly more menacing—principally because it is not the forest’s inhabitants who are malevolent, but the forest itself. It shifts and moves, and Merry had warned, seeming to crowd in on them, and turning their path away from where they want to go until they finally halt for a rest in the shade of Old Man Willow. This depiction of forests as sentient is absent from The Hobbit, but is a powerfully recurring trope in LotR. We might in fact look at forests as embodiments of memory: indeed, Tom Bombadil’s dire description of the trees emphasizes memory, characterizing them, again, as “remembering times when they were lords.” Later, Elrond will say of the Old Forest that of it “many tales have been told: all that now remains is but an outlier of a northern march. Time was that a squirrel could go from tree to tree from what is now the Shire to Dunland west of Isengard.” Again: an implied kinship between elves and forests, both of whom remember the world when it was young. The elegiac quality of LotR can be also read in this light, as the loss of that ancient memory—the forests have shrunk, often from the depredations of Men, and the Elves themselves are leaving Middle-Earth. The trees, obviously, cannot follow: and the mortal races (like hobbits) must needs only enter such forests at their own peril, and hope they might have a savior like Tom Bombadil.